We’re no strangers to celebrity homes. From condo units and family homes, to high-rise havens abroad and rural retreats, it’s safe to say we’ve seen quite a number of interesting spaces. 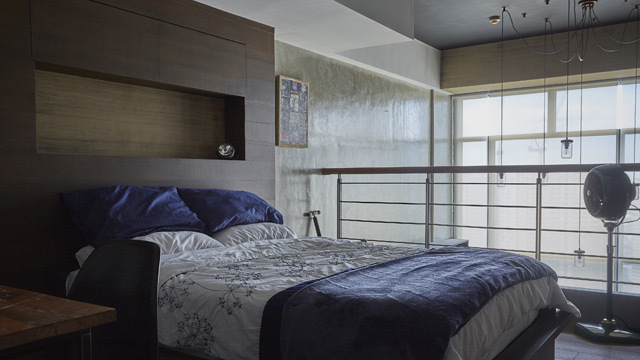 Manny and Jinkee Pacquiao’s properties have been some of our most-viewed homes on the website. Their former house in Los Angeles, California has bold colors and spacious areas and these same elements can be seen in their beautiful home in General Santos City. Unbeknownst to some, the Pacquiao family also has a house in Forbes Park, Makati City. Based on the photos Jinkee shares on Instagram, this property also follows the theme of their other homes. Rich colors, well-thought-out furniture pieces, and open spaces make it an ideal haven for the growing brood. It has glass windows and an envy-worthy outdoor area that will remind you of a resort, too. We won't mind spending hours in this cozy nook, reading a good book or maybe just listening to some soothing music. The living area is kept bright and airy—thanks to glass windows and doors leading to the pool area. 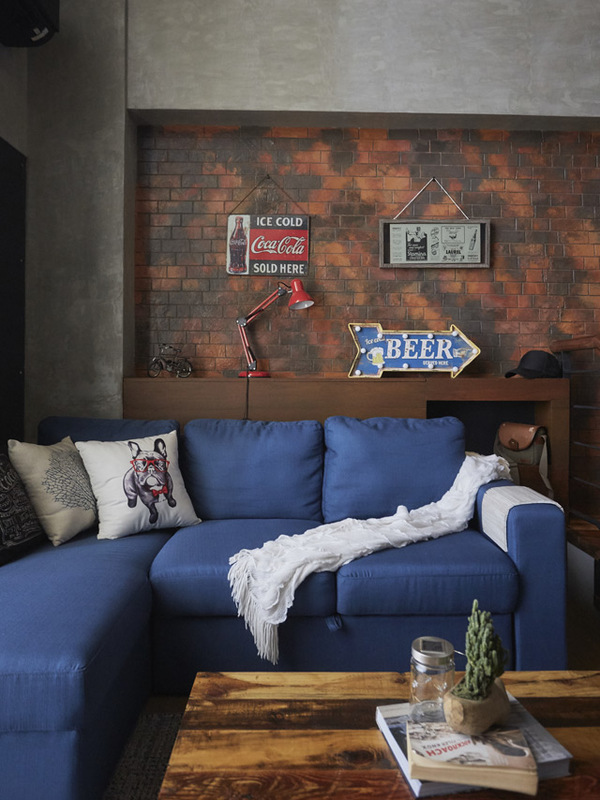 If you have a similar-colored sofa at home, take your cue from Manny and Jinkee's space! Spruce up a neutral sofa with pillows in orange, red, and mocha—shades that can add warmth to your home. RL Tip: If you want to change the look of your living area, try and set up a simple vignette on the coffee table. Say bye bye to clutter and limit your pieces to enchanting blooms in a vase and a few scented candles. Shop for a similar sofa and pillows at Our Home. To be able to enjoy a bright, airy, and spacious home, maximizing natural light and investing in the right furniture pieces are important. In this stunning property, all windows are kept open and only select pieces decorate the areas. For your own home, consider going for pieces that make an impact. You may have a few items, but these count and stand out. As we all know, the kitchen is the heart of the home. It's not only a place where meals are prepared, it's also the sweet spot where we sometimes gather to enjoy a quick snack with our loved ones. The Pacquiao family kitchen not only boasts of topnotch appliances, it also has an island that can accommodate the couple and their kids for pizza night and quick bites. RL Tip: If you've been planning a kitchen makeover for years, this can be your peg. Consult with a professional to see how you can install appliances properly and how you can keep it a safe and welcoming space. For starters, you may want to invest in quality countertops. Click here for options. In this home, guests will surely dine in luxury. With a table that can seat around 16 people, upholstered chairs, a carpet, luxe accessories, and captivating lighting pieces, this nook can rival your favorite hotel and restaurant. RL Tip: Want to achieve something similar? Invest in chic matching chairs and a sturdy table. There are options in different stores—choose pieces that fit in your space. Find similar chairs at SM Home. A relaxing escape nestled in the middle of the city? We'll take it any day! The Pacquiao's has a peg-worthy outdoor area. With a pool, towering trees, and different plants—we're sure they wouldn't feel like they're in a busy city like Makati. RL Tip: Buying outdoor furniture shouldn't be done in haste. You need to consider the materials used and if it can withstand the heat, the rain, and other elements. Speaking of garden furniture, the pieces in this home look sturdy yet inviting. The wire base complements the architecture of the home, while the cushions promise to give you a fun, relaxing time under the sun. Though the pieces use materials that seem stiff, the curves of the seating pieces soften the overall look of the area. Shop for similar pieces at LRI Design Plaza, Bel-Air II, 210 Nicanor Garcia Street, Makati City. The sound of water can be calming and it can give a welcome break from the noise of the city. Just like Manny and Jinkee, you may opt to add fountains in your garden as part of your home improvement project. Do note that you can't just install a water feature in a snap. It's best to consult with a professional. 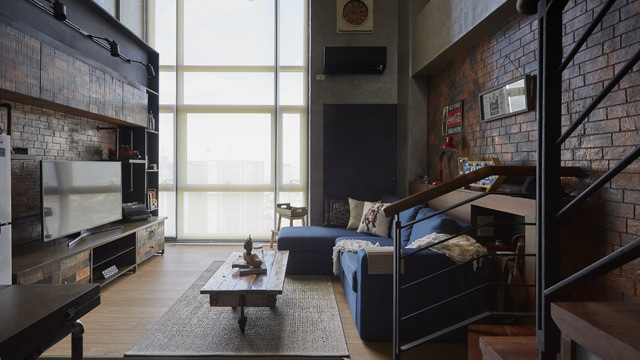 The 55sqm loft-type condo has one bedroom and two bathrooms. While mostly dark finishes were used, itâs kept bright and welcomingâthanks to tall windows that let in plenty of natural light. 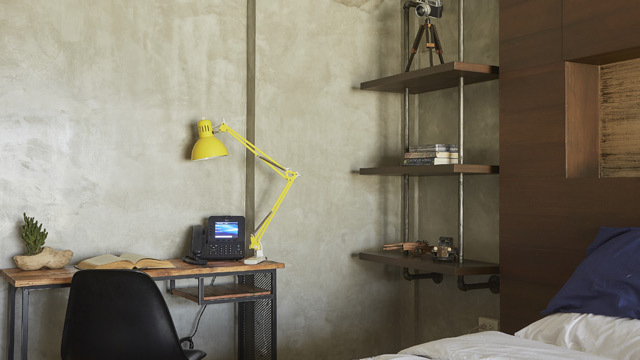 To achieve the industrial look, Kenj worked with weathered wood, exposed brick, industrial lighting pieces, and concrete. A few adjustments were made during the unitâs renovation as they had to consider certain rules and limitations. "What makes this unit stand out is the character it has. 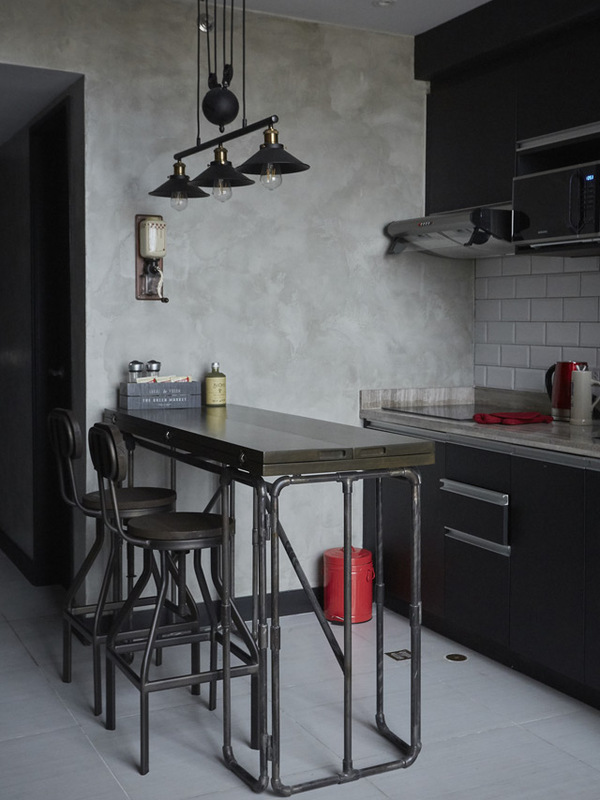 Itâs a beautiful distressed residential space with touches of vintages accessories," says Kenj. 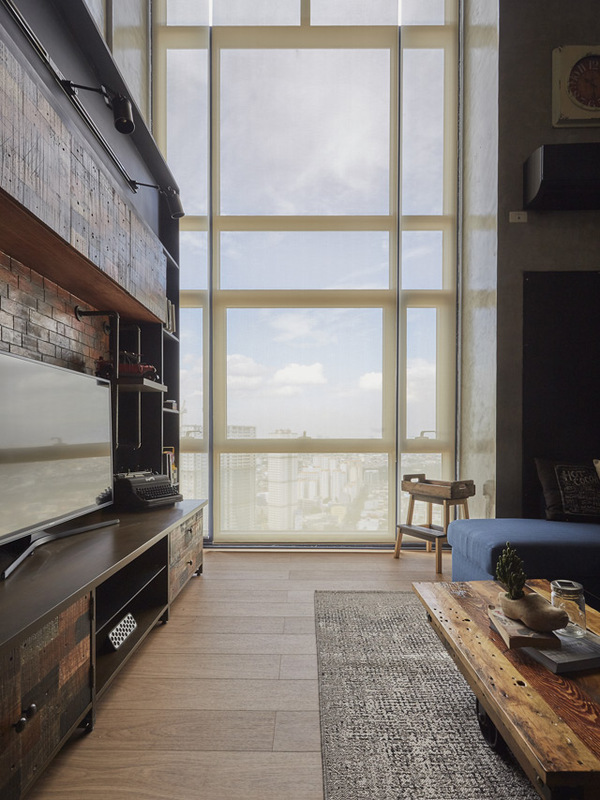 The living area is reminiscent of a New York flat with a beautiful view of the city as icing on the cake. The bricks featured in the area are not the usual ones we see in industrial-inspired spaces. âThe client [wants to use] bricks, specifically the burnt ones. It became my jumping-off point since the materials and finishes need to complement the bricks,â shares the designer. They initially wanted to change the flooring in the living area but the admin of the building was against chipping. To solve this challenge, Kenj opted to create a step-up and raise the living area to separate it from the other parts of the home. Lights were then added underneath the edge of the platform. To make the living area as inviting and relaxing as possible, a neutral area rug was added. This addition made the space seem warmer and perfect for lazy weekend afternoons. The other side of the area highlights a stunning storage piece featuring wood, bricks, and shelves in matte black. According to Kenj, it was difficult to find the bricks the owner wanted. âThese bricks also posed maintenance issues and might add too much weight and stress on the walls. The solution we came up with is to go with a faux finish. This option enabled us to control the color and intensity, plus itâs easier to maintain,â says the designer. 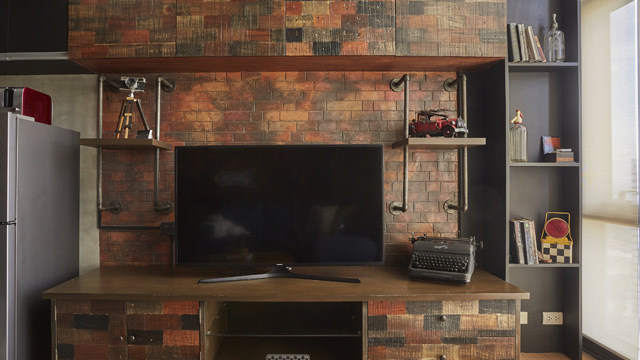 The TV wall in the living area showcases the beauty of the bricks, with the storage piece following a similar look to make it cohesive. 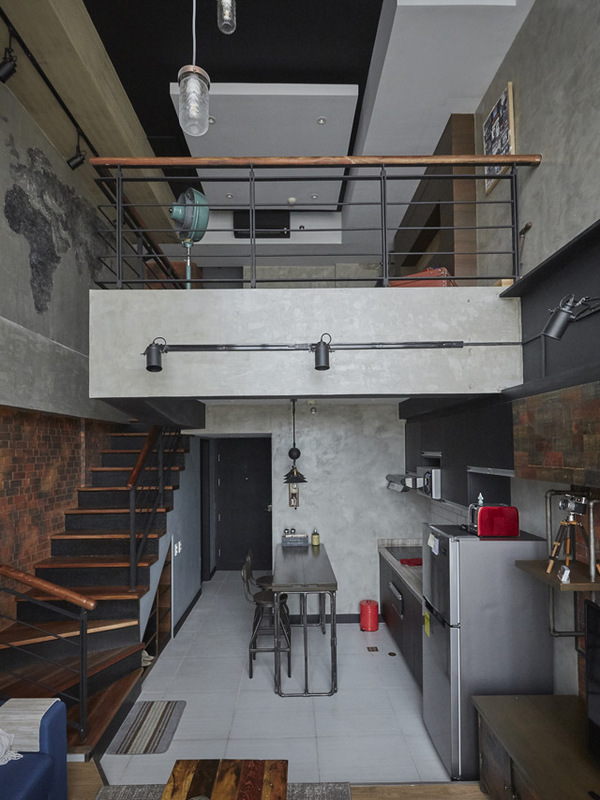 To complete the industrial look, the shelves also feature exposed pipes as support. Most of the pieces in the unit were customized by Oliohaus Custom Furniture. Follow them on Facebook and Instagram. 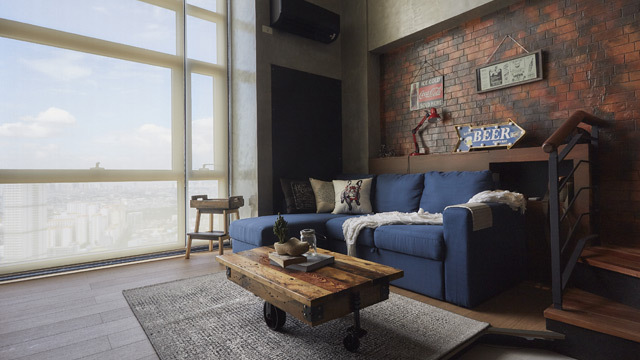 Opting for a blue L-shaped sofa and keeping the rest of the walls in polished concrete softened and balanced the look of the living area respectively. Since the owner wanted the unit to have a vintage feel, some of the accessories look like old school signs and framed prints. Find similar pieces at Urban Abode,ÂUnit E - Prime 08-B, CW Home Depot-Ortigas, 1 DoÃa Julia Vargas Ave., Pasig City. Concrete dominates this side of the condo unit from the main door. Look closely and see how Kenj was able to incorporate a compact storage nook under the stairs. It can be used to keep shoes in place. Meanwhile, the dining and kitchen areas share space-making cooking and enjoying meals efficient. Most of the lighting pieces used in the unit were sourced from depots. âIn the living area, the client liked the idea of a mason jar lighting fixture. Given the high ceiling, it wasnât easy to source for a readily available piece. We went for a custom lighting fixture and went to a supplier in Clark, Pampanga to make the piece. It was installed in varying heights,â shares Kenj. "I had to play around with the pieces used in the dining area because my client wanted to use a folding table to maximize the space. Taking inspiration from my experience growing up, I designed a table that folded differently from what weâre used to," shares Kenj. The metal support of the table matches the barstools chosen as seating pieces. These picks work well with the lighting fixture and cabinets in matte black. The designer wasnât sure about using black in the unit as the color seem too heavy on the eyes. ""My project manager suggested matte black. We used it for the loft beams, false beams, kitchen cabinets, closet doors, and the ceiling,"
he adds. Pops of red and white subway tiles complete the cooking area. Find similar pieces at Match Contract Furniture, 2100 Chino Roces Ave., Makati City. A short flight of steps leads to the loft. Instead of keeping the walls plain and bare, Kenj asked his uncle, muralist Jun Ureta to spruce it up. 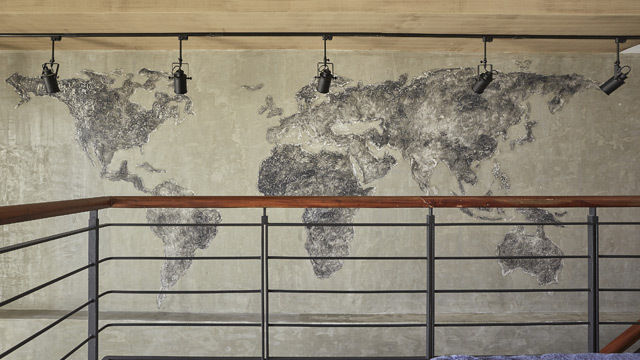 A world map mural adds personality to the home. "Itâs my favorite hack in the unit," shares Kenj. The designer helped in finishing the mural as during the construction and polishing stages of the project, Jun had to recover from an eye surgery. To further highlight the work of art, track lights were installed as well. The sleeping area is a cozy retreat. Kenj shares that the team wanted to expose all the pipes housed inside the boards. "When we saw that itâs the plumbing line of the unit above, we had to change gears. We also wanted an authentic wood pallet bed but it posed structural issues so we opted for wood slabs instead, then had it finished the same way as some of the pieces in the living and dining areas were done to tie the look together," explains the designer. Find a similar bed at Crate & Barrel, G/L Annex Building, SM Makati, Makati City. Some of the accessories in the unit were bought by the owner during his travels. One of the pieces that caught our eye is this upcycled must-have. 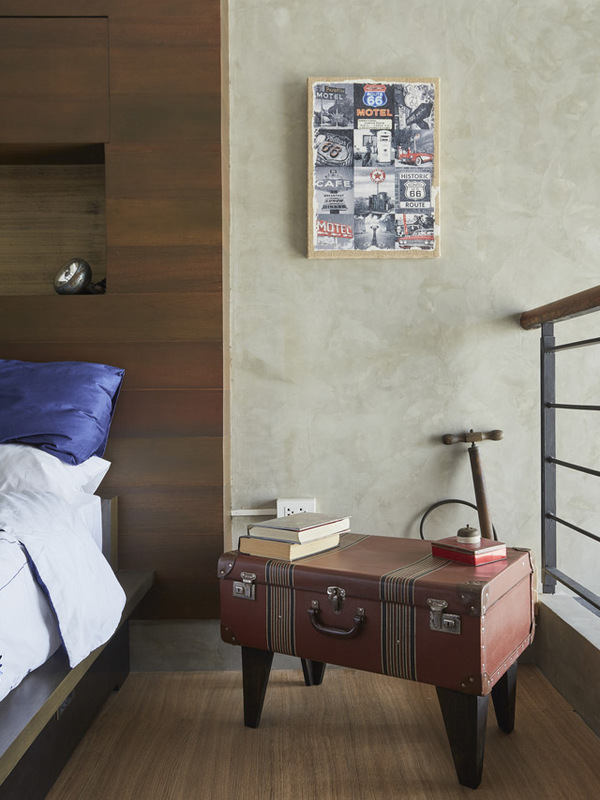 An old luggage now functions as a pretty side table that matches the overall look of the unit. Upcyclist Paco Pili creates similar pieces. Follow him on Instagram @upcycleph. To keep within the theme of the home, wall-mounted shelves highlight the expert use of pipes and wood. Even the work area follows the industrial look perfectly. The table features a wooden top and a metal base. Of course, the chair is in matte black. For similar pieces, follow DEKKO Furniture & Design on Instagram. Ready to build or renovate your home? Get in touch with interior designer Kenj So through mobile at (0977) 837-6541 or email idr.kenjso[at]gmail.com. What Do the Majority Owners of PH’s No.1 Car Maker Really Think of the New Taxes on Automobiles? How Much Money is Dengvaxia Manufacturer Sanofi Pasteur Making in the Philippines?